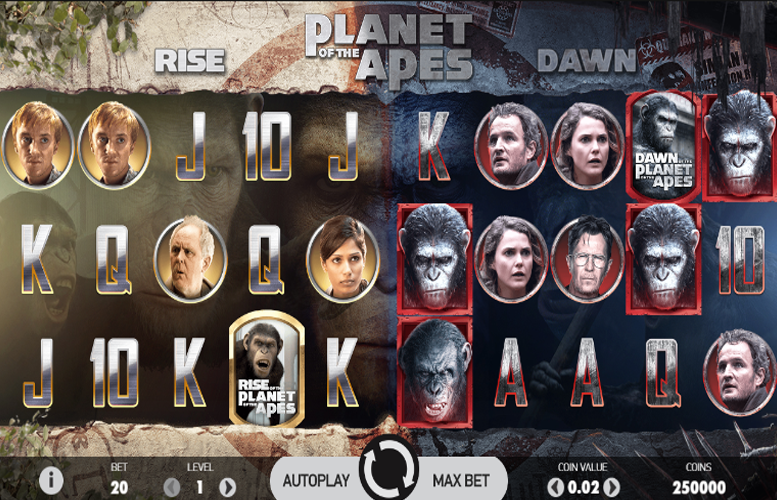 The Planet of the Apes slot machine is based on the motion picture titles Dawn of the Planet of the Apes and Rise of the Planet of the Apes. These provide an ideal theme to not only let the designers get creative with some excellent visuals but also especially innovative bonus features. Players who enjoy slots with plenty of different variations of bonuses away from the main game will certainly enjoy it. Excellent visuals. The recent prequel and sequel to the classic movie provide a great theme for an action-packed slot. Innovative and varied game board and special features. This makes for a game with loads of replay value. Potentially confusing for novice players. There is a lot going on. This may put some people off playing Planet of the Apes. Movie Title Symbols = 1,000x the line bet. “Wilds” = 600x the line bet. Stern Ape = 600x the line the line bet. 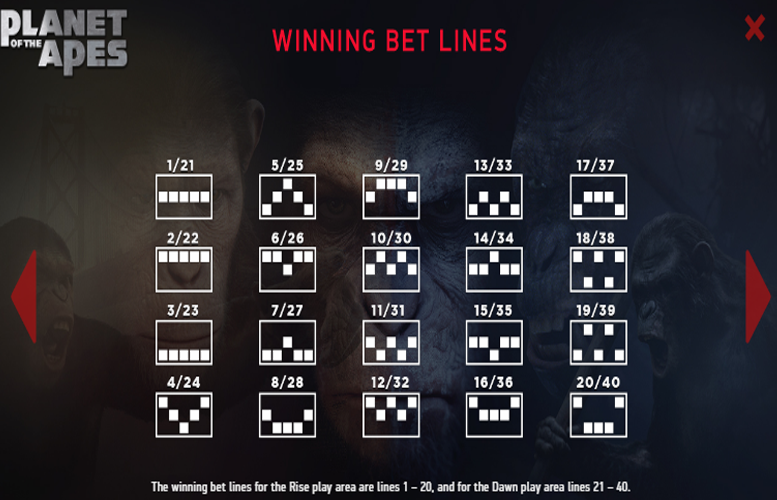 Snarling Ape = 400x the line the line bet. Humans = 180x the line bet. Before each spin, there is a chance that the Dual feature will be triggered. If it is, one symbol is chosen for each play area. The same symbol is not able to be chosen for both areas and “wild” and “scatter” symbols are also unable to be chosen. If a symbol lands in its corresponding play area when the reels stop, it will stick. If it lands in the other play area, it will transfer over to the correct side into the corresponding position. If the Rise Bonus symbol lands on the first reel, the Rise Bonus feature is triggered. 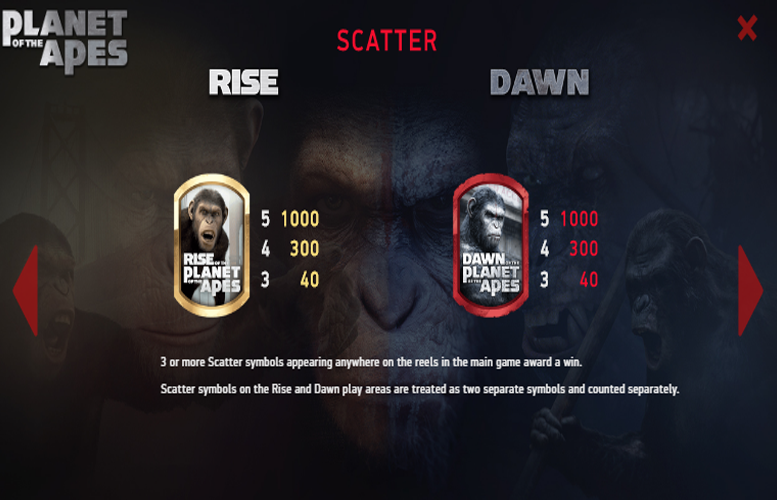 This side game gives players an additional coin win that is awarded for every human and ape symbol displayed on the screen except for the “scatter” symbol and only appears on the Rise play area. The coin win is paid in addition to any line bet wins on the reels when the feature is activated. If the Dawn Bonus symbol lands on the last reel, the Dawn Bonus feature is triggered. The Dawn Bonus feature is a feature that transforms ape and human symbols into the same type and only appears in the Dawn play area. 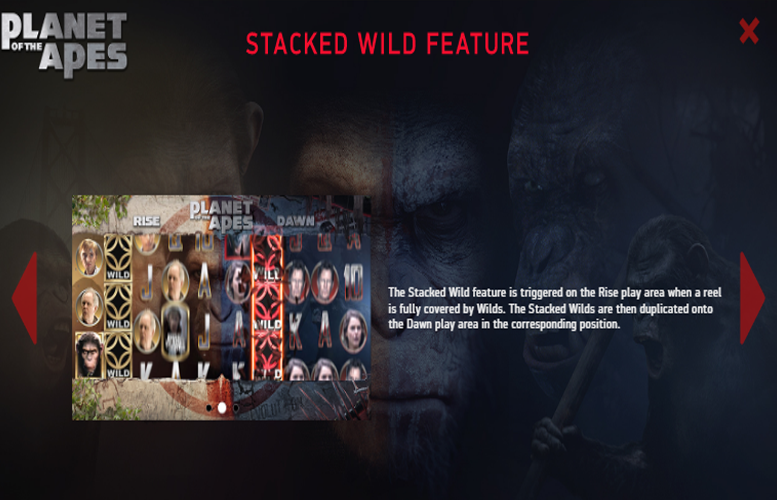 The Stacked Wild feature is triggered on the Rise play area when a real is fully covered by “wild” symbols. The Stacked Wilds are then duplicated onto the Dawn play area in the corresponding position. Landing three or more “scatter” symbols anywhere on the reels in the Rise area will activate the Rise Free Spins. 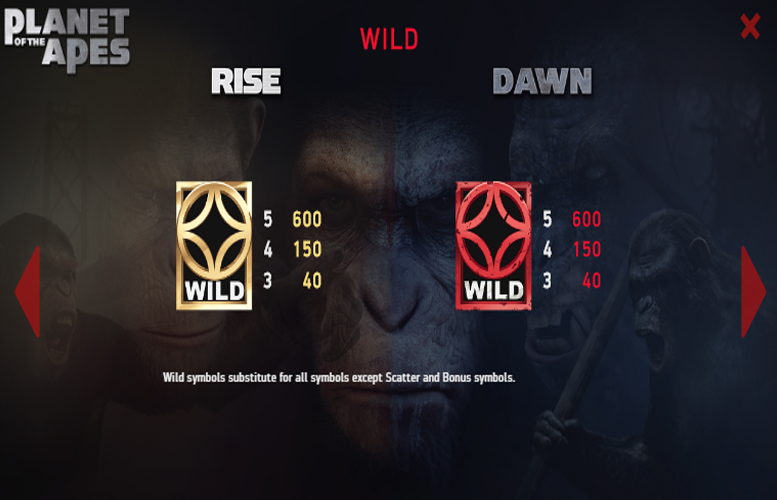 Players will receive 10 free spins, during which the number of “wild” symbols that land on each spin are collected. On the last spin, all collected “wild” symbols are randomly placed on the play area. Landing three or more “scatter” symbols anywhere on the reels in the Dawn play area will activate the Dawn Free Spins. Players will receive 15 Free Spins. During the Dawn Free Spins, there are three different “collect” symbols that activate a corresponding meter. These are: Multiplier, Extra Wild, and Extra Free Spins. When a “collect” symbol lands, it fills the corresponding meter by one. When it fills entirely, it will activate the feature. As is common on modern slot machines, the regular symbols on the Planet of the Apes slot machine have been taken from the upper end of a standard deck of playing cards (A, K, Q, J, 10). All these regular symbols in the Planet of the Apes slot machine will pay at 80x the line bet. The number of win lines is fixed at 20 on the Planet of the Apes slot machine. Therefore, players are only able to adjust the number of coins bet per line and the value of each of them. The highest and lowest coin values are £1 and 1p respectively. Meanwhile, it’s possible to bet between one and 10 of them on each line. This makes the largest possible bet on the Planet of the Apes slot machine £200 and the lowest just 20p. The Planet of the Apes slot machine is a winner in all respects. It looks great, has plenty of special features, and has lots of action taken directly from the two follow up titles to the early motion picture classic. Fans of the movie itself are sure to love it. With so much going on, we’re confident those who are less interested in classic sci-fi will also get plenty of enjoyment from this game from Netent too. This game has a rating of 5 / 5 with 652 total reviews by the users.